Ankle arthroscopy is a minimally invasive surgical technique that allows us to directly examine the surfaces of the ankle joint and in most cases proceed to a beneficial treatment there and then. Prior to cutting the skin the ankle is physically examined whilst you are asleep so we can put it through a range of movements and tests you might not tolerate awake. The purpose of this is to look for the actual range of movement possible and also any signs of ligament damage (Instability). 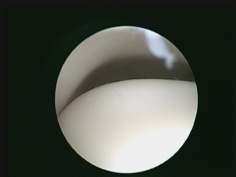 Once the scope is in the joint it is inspected and any damage and most areas of normal are usually photographed for keeping in your medical notes. This ‘diagnostic’ procedure is as important as any subsequent treatment for the information it provides. All performed through the ‘keyhole incisions. These are undertaken as necessary and certainly not all in all cases. This refers to the removal of fatty tissue, scar tissue or lining tissue that may bulky or inflamed (Synovitis) This occurs in over 90% cases . This is the technical name for removing through grinding or ‘Burring’ away prominent and abnormal ridges of bone (Osteophytes). These prominences have usually resulted in “impingement pain” whereby movement is painfully limited as opposing ridges of bone pinch each other during normal movement. (See xray). Occasionally pieces bone have broken off and sit in the joint as ‘loose bodies’ which can also be removed. If they are large then occasionally larger scars can be required to achieve this. Osteochondral Defects - OCD’s are isolated patches of damage to the surface cartilage of the joint. They can vary from the size of a lentil to postage stamp size or larger. Patches of soft unstable cartilage with underlying damaged bone. In effect they are a small discrete patch of severe arthritis. Very occasionally a portion of bone is still attached to the flap. Once found this cartilage cannot be stabilised or repaired so is cut back to the good adherent, stable cartilage leaving the discrete patch of exposed bone underneath. If left this would not just heal so is treated with Microfracture. The top layer of bone is broken through with 2mm ‘pick axe’ to stimulate the bleeding of stem cells into the defect. Like that on the skin scar cartilage never looks quite the same but will usually function in much the same way. The restoration of a stable cartilage, albeit ‘scar’ cartilage provides satisfaction with pain relief in up to 85-90% of cases. This is dependent on the size of lesion and associated joint damage. The operation is usually undertaken as a Daycase procedure allowing you to return home the same day if you have a partner or other adult who can stay with you for the 1st 24hrs. It is performed under a General anaesthetic unless there are medical reasons to avoid this. This would be discussed with an anaesthetist prior to the surgery. You will have a tight strap placed around your thigh (Tourniquet) for the duration of the operation. This area can feel a little bruised for a few days after. After the operation your ankle will be wrapped in bandage and should be comfortable as local anaesthetic will be instilled into the operation sites. This will wear off about 6-8 hrs later and you will need painkillers. Usually little more than distalgesic or ibuprufen is required but take this regularly for 24-48hrs as the surgery pain settles. Some swelling initially is normal. You must try to minimise this by resting with your foot elevated “Toes Above Your Nose”. As a guide it should be elevated for 45-50minutes of each hour over the 1st two weeks. You will be guided by the nurses on management of your bandages and dressings before you leave and they should be left alone unless instructed otherwise. This will depend how much and what type of work has been done within the ankle. We will discuss this with you after the surgery and form a recovery and rehabilitation plan with the physiotherapists. As a guide though, we usually recommend you Toe touch weight-bear with crutches for 2 weeks initially. Toe touch??? – Imagine you can rest your toes on a snail but must not break the shell. Should I move the ankle? Unless otherwise directed it is important to move your ankle around from the beginning, even with the bandage on. This both helps prevent stiffness developing but also fights against blood clots (Thrombosis) by helping with blood circulation. Carefully Moving from bed to couch, even using the stairs where necessary is fine. This is very dependent on the actual procedures undertaken and so not really predictable. You will of course be informed in detail of this once the operation details are known. The physiotherapy rehabilitation of these procedures is all important and adherents to the instructions given during the pathway even more so. The team will regularly treat and assess your progress after the surgery for 3-6 months. When will I be seen again after the surgery? 6 weeks after the surgery you will have an appointment to assess progress with respect to surgery pain settling and consider progression from recovery to rehabilitation. The exact nature of this depends on the individual surgery done. At ~3 months:- You will be seen to assess the on-going rehabilitation of the surgery and look to your expected outcome. This will commonly be your final surgical planned appointment. Tendon damage – The incisions and tracts into the ankle pass very near tendons around the ankle and occasionally these can be damaged causing pain and extremely rarely subsequent rupture. Recurrent Symptoms – Arthroscopy has its limits and occasionally the damage progresses and becomes increasing symptomatic with time. As yet we have no cure for general joint arthritis / damage. Dissatisfaction – The evidence to date has shown an overall satisfaction with the various indications from 65-90% with this surgery. It is designed to improve the situation. Stiffness – The body reacts to surgery much like an injury and wants to form scar tissue. This, if left unchecked can become tight inducing stiffness in the ankle or incision. Physiotherapy and your rehabilitation regime is designed to minimise this. Occasionally however the scar tissue builds and can cause frustrating stiffness in the medium to long term. It is important that you notify us if you get a persistent increasing pain after you go home, and particularly if the pain does not settle with elevation and mild painkillers, as this may indicate early infection. Similarly if you get swelling of the leg or foot which does not settle when the foot is elevated above heart level you should seek medical advice. Any high temperature or fever should be alerted to a doctor. What are the alternatives to ankle arthroscopy? Continue as you are accepting your on-going quality of life. Steroid injection may be considered. These guidelines are intended to help you understand your operation, and to help you to prepare yourself and your ankle for it. Some patients will want to know more details. Please ask, and I will be happy to add additional notes or comments for your assistance.